Did you know that when your child plays make believe they are conquering new developmental stages? This pretend play, often referred to as dramatic play, is a valuable tool in a young child’s development. They begin to explore their world, re-enact what they see adults doing in hopes to make sense of the world around them. This natural learning occurs as young as infancy, when babies begin to hold a pretend phone to their ear and “talk.” This action is the early formation of expressive language which leads to literacy and explains why our children keep taking off with our cell phones! As children enter pre-kindergarten, dramatic play continues to play an important role in learning social exchanges, reasoning skills, and developing new vocabulary and conversational language. 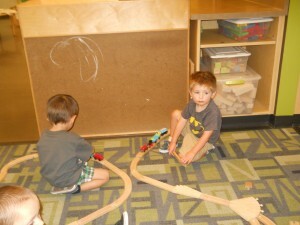 Solitary Play-Children play by themselves to explore their surroundings and gather information. This type of play is typical of children 2 and under. For example, children may walk around the living room talking on a cell phone and pushing a stroller. Children at this stage begin to develop a love for dumping and filling items, so purses and bags become an important part of their play. Parallel Play- Children play next to each other, but not necessarily engaged in the same activity. Generally children begin exploring with this type of play around age 2. For example, a toddler might be building a train track while another child is nearby building a tower. They might intersect in play and comment on the others creations but the interaction will not be preplanned. Cooperative Play- This advance play includes multiple children engaging in one story line of dramatic play for short periods of time. Children must engage with one another to develop and follow through with a plan. You might hear children say, “You be the baby, I will be the Mommy” or “I’ll build the road and you build the tower.” There is a give and take in this type of play that develops a child’s social and cooperation skills. Here at Wirtzie’s Preschool and Child Care we value your child at every stage of their play development. In the Wobbler Room you will find a small dramatic play kitchen with plenty of bags and purses. These little guys typically retrieve a dramatic play item and carry it around the room engaging in self play then dropping it on the floor when something else becomes more interesting. As your child enters the Toddler Room, you will find that the dramatic play center has grown and includes doll furniture and a small table. This allows for the beginning stages of parallel play, where children can have space to spread out and many themes to spark their growing imaginations. The large train table and many play sets allow for various types of pretend play as children begin to develop strong preferences in their play. Our Preschool and Pre-K Rooms have advance dramatic play areas including a kitchen, dolls, doll houses, and various play sets. The teachers work hard to engage the children in dramatic play by incorporating new materials matched to what the children are currently learning. For example, the Preschool Room is learning about ocean animals and their dramatic play area includes waves and a baby pool. The Pre-K Room has been learning about camping and forest animals so they have a tent, camping chairs, a pretend fire, plenty of forest animals, and a fishing pond. By incorporating these materials children naturally reinforce the learning that has taken place throughout the day. Ms. Loretta is engaging in dramatic play using farm animals. By sitting with the children Ms. Loretta is able to help develop the children’s vocabulary. 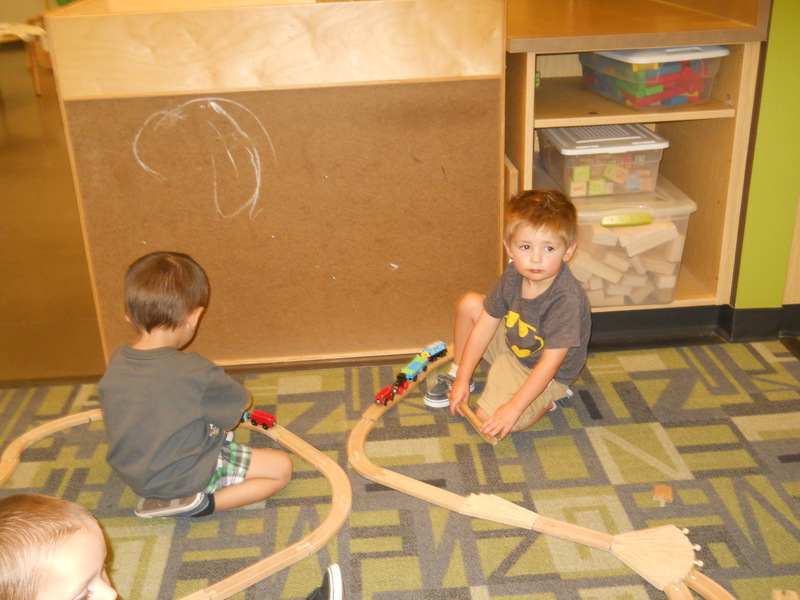 These toddler boys are engaging in parallel play. Building train tracks separately but within a close proximity in order to engage in social interaction. My 2 daughters attend Wirtzies and it has been an amazing experience. My 3 year old, Hailey, has been there since she was 8 weeks old and my 1 year old, Abby, recently started in their Wobblers room. The teachers are one of a kind and really care about the children. Hailey wakes up most mornings and asks if it is “a school day”, knowing she is excited to go makes me at ease. Abby has grown to love the staff and barley gets upset when I leave her each day now. Some of my favorite things about Wirtzies is the intergenerational program. I absolutely love that the kids have the opportunity to interact with the seniors. Hailey loves talking about “the grandmas and grandpas’ and about what they have done in the group that day. I also love that they have a splash pad for the kids in the hot summer months. This is a huge hit with my daughters and nice to know they have some refreshing water time. I also love their teaching styles and programs. My 3 year old has learned to almost write her name, knows the alphabet, knows all of the days of the week, and so much more. Hailey would not be as smart as she is without Wirtzies. A huge thanks to all of the amazing staff at Wirtzies and kudos for all the great things they provide to the children there.